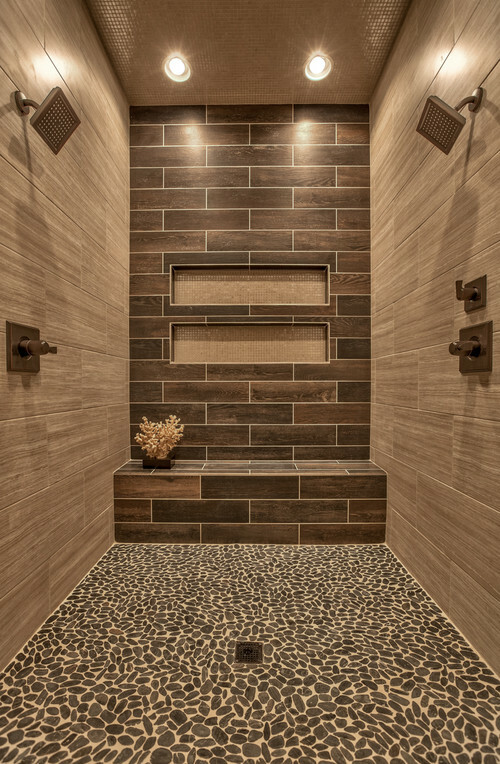 Supersized master showers reign, according to the 2015 Houzz Bathroom Trends Study. Showers are expanding with many of the more than 3,000 home owners recently surveyed saying they plan to upgrade their master showers and increase its size. Northeast home owners were found to have the biggest love for their master showers and are planning the most upgrades. But many non-master full baths, especially in the West, are also getting supersized shower stalls, the survey found. Thirty percent of those surveyed by Houzz who say they have plans to upgrade their master shower plan to make it 50 percent or more larger than its current size; 19 percent plan to make it between 25 percent to 50 percent larger. Ceramic tile, followed by porcelain tile, is the most popular flooring choice. Painted walls are by far the most popular choice, while wallpaper is only used in 3 percent of remodels. Recessed lighting and wall sconces dominate as the most popular lighting choices. Baby boomers are more likely to install grab bars and curbless showers in their master bathroom remodels. But non-slide floors, hand-held shower heads, shower seats or tub seats, and thermostatic mixers are growing in popularity among all generations. Are Home Sizes Finally Done Shrinking? Great tips, I’m going to start putting together a plan for my bathroom! And I love that picture, what a cool looking bath. Awesome post… One thing I think people over look is speakers! I think a great addition to any bathroom is a sound system to play music while you are in the shower or bathtub!! This will be a great addition and another selling point that can surprise your buyers.